Which handprint do you think is mine? This is the story of last summer - the handprints of everyone I gathered close to myself, sure it would be Mary's last summer, assuming it would be Maggie's. These squares of silvered paper on canvas are a magic carpet and they take me back to those days of 5 owls - mornings spent in meditation, standing beneath them, matching my breath to that of the trees. My fingers flutter over these keys, unsure of the words for this image, the image so much speaking for itself. It is a visual journal on one piece of canvas, the handprints full of a million stories each. Place your hand on one and you are flying an airplane that has caught fire, your head out the window trying to see through the smoke, scanning the Oklahoma highway beneath you for a place to land. Lay your hand atop another and you are standing in a hospital parking lot in the cold winter air, a cup of ice in your hand, breathing in . . . 2, 3, 4 . . . and out . . . 2, 3, 4 . . . until the trembling passes and you can make your way back into the emergency room to hold your mother's hand. Place your hand elsewhere and you are 4, wearing the first dress-up Christmas dress you will remember, and you are the beautifullest, you tell yourself, the beautifullest. Put your hand there on the far right side, right against the edge of the canvas, and you remember the death of your father at your mother's hand, she no longer able or willing to tolerate his abuse, and you remember your family torn apart, brothers & sisters separated until adulthood. Put your hand across that bottom print and you will hear music, an opera, a symphony, and you will find yourself with a cat or 2 in your lap. Pick another and you are 94, surrounded by friends heartbroken to let you go, but letting you go nonetheless. Someone asked me recently that age-old question "If the house was on fire and you could take only one thing, and Maggie was safe, what would it be?" and I had no answer. I'd forgotten about this painting, the histories it holds. This would be it, I think. It holds the energy of every one of us who painted our palm titanium white and laid it on the square of our choosing. My mother's fingertips touch mine, and my brothers' prints lay at the base of her palm; Emma is her crown. Michael's thumb crosses mine - we are all connected. there all by himself in the lower left hand corner. Someone is holding his other hand. come together - right now. over me. These are some powerful revealings, and each of us has a similar print. I love what you've done with it. The question of what would you take, is a difficult one. I'd have to save photos. Old photos in boxes. They cannot be replaced and most other things can. I absolutely LOVE this painting and what a great idea. I too have some that will soon be gone (and others that I sometimes wish were). I wish I had thought to do this with my grandparents, father, etc. You have given me the best idea, you are, as always, my inspiration. Love you! This is so very beautiful. It was only when my paternal grandmother died a few years ago that I realized I know very little of my family's stories... Now, I have only one grandparent left, and I live so far away from all of my relatives. You are very blessed to have been able to do this. This is such a beautiful post and this painting a touching memory, what a beautiful way to say goodbye. this is so beautiful. i love this painting. you are such blessing to me. Oh,Debi...this is such a touching, and powerfully true post. I found the whole way I looked at my life changed when I finally understood that we are all truly connected. This is perfect. So you. So full of life. All of life, pain and joy. Love and aloneness. 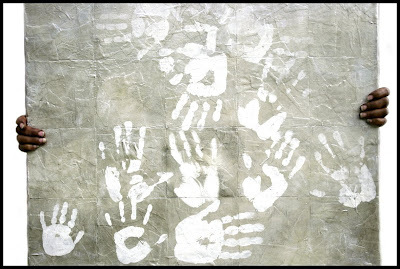 The handprints of other lives reminded me of a post I wrote about my fathers hands. It makes me wonder what legacy my own hands will leave behind for my daughter. WOW this is powerful. i love it and its meaning. thanks for sharing this on SS today. SO great.